Friendly Kent based financial advisers covering the South East and London, giving financial and mortgage advice since 1994. As featured on BBC television and radio. three profiles were found for Citrusfinancial.co.uk in social networks. Among other social networks the website is represented in Facebook, Twitter and LinkedIn. 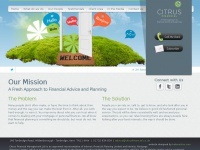 The web server used by Citrusfinancial.co.uk is located in Athens, Greece and is run by FORTHnet SA. On this web server 52 other websites are hosted. The language of those websites is mostly english.